Although there is no shortage of definitions for pragmatics the received wisdom is that 'pragmatics' simply cannot be coherently defined. 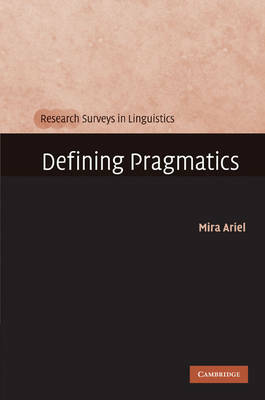 In this groundbreaking book Mira Ariel challenges the prominent definitions of pragmatics, as well as the widely-held assumption that specific topics - implicatures, deixis, speech acts, politeness - naturally and uniformly belong on the pragmatics turf. She reconstitutes the field, defining grammar as a set of conventional codes, and pragmatics as a set of inferences, rationally derived. The book applies this division of labor between codes and inferences to many classical pragmatic phenomena, and even to phenomena considered 'beyond pragmatics'. Surprisingly, although some of these turn out pragmatic, others actually turn out grammatical. Additional intriguing questions addressed in the book include: why is it sometimes difficult to distinguish grammar from pragmatics? Why is there no grand design behind grammar nor behind pragmatics? Are all extragrammatical phenomena pragmatic?